I have been knitting off and on since my last knitting post, a while back. I would be done with the Soleil top, but I messed it up big time last week and had to rip it back a way. So I have set it aside for a couple of weeks to get over my anger at myself. In the meantime I’m working on the Bad Penny sweater from Knitty.com (just starting), and a pair of socks. 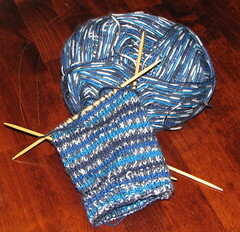 Pictured here is my first attempt at a sock, and it’s going more quickly than I expected. The double-pointed needles are sort of a pain, though. But they are getting easier. I have other pics — of Soleil in its current stage, and of the yarn Jason brought me from Germany for Bad Penny — on my Flickr knitting page.